Geneva - The Arab coalition’s air-forces have targeted 240 prisoners in Yemen - some of them civilians - resulting in about 30 people dead and another 32 wounded, while 40 others are still missing. This indiscriminate targeting of people is appalling, says the Euro-Mediterranean Human Rights Monitor. The Arab coalition’s air-forces have targeted a Houthi military police prison in Marib street in the Yemeni capital of Sana'a. Most of the prisoners targeted by the strike were detained by the Houthis on political backgrounds. They were transferred earlier from the central prison in Sana’a to the police military prison. The Houthi forces fired at the prisoners who tried to flee at the moment of the bombing, eyewitnesses told the Euro-Med team. Meanwhile, they have managed to take out 71 prisoners, transferring them to the central prison in Sana'a. 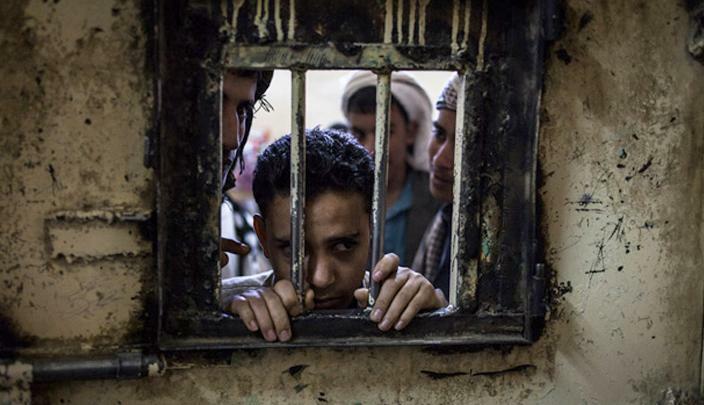 The Houthi militias bear responsibility for placing prisoners inside a military facility. Using such places to detain dissidents while knowing that the Arab coalition forces have been targeting military posts on a regular basis account to using these dissidents as human shields. This is a serious violation of the third and fourth Geneva Conventions, and could amount to a war crime. The International Humanitarian Law (IHL) prohibits the use of civilians to protect military areas or personnel from attacks or to force civilians to directly assist in military operations. Under IHL, these prisoners should rather be protected. The Arab Coalition forces are also responsible for making sure that the sites they are targeting do not have civilians. Failing to do so has resulted in disproportionate harm against civilians. The Euro-Mediterranean Human Rights Monitor calls on all parties to in Yemen to abide by international laws and conventions to protect civilians and spare them the scourge of war. All parties involved in the conflict should take the necessary precautions to distinguish military personnel from non-combatants, while ensuring the safety and freedom of civilians and prisoners in Yemen. The Euro-Mediterranean Human Rights Monitor further calls on the UN Security Council to intervene to put an end to the war crimes that have claimed the lives of tens of thousands of civilians inside Yemen and to activate the work of the commission of inquiry set up in Yemen to ensure accountability for those crimes.